Honda CB300R sold out till mid 2019: What are your other options? Honda launched the all-new CB300R in the Indian market earlier this month for Rs. 2.41 lakh, ex-showroom Delhi. The all-new bike takes on the likes of KTM 390 Duke and is a completely knocked down (CKD) product. Honda earlier started taking bookings for the all-new CB300R in the Indian market, and the first batch of the bike is completely sold out in the Indian market. The all-new CB300R can now be booked at Rs. 5,000, but the delivery will happen in the second batch of the bikes, which will arrive after three months in the market. If you can’t wait for the Honda CB 300R to be made available after a few months, you have a few other options. One, you can opt for the KTM Duke 390, which is just Rs. 2,000 pricier. It’s a lot more powerful than the CB 300R, looks sharper, and is more feature packed. If you have a larger budget, you could also look at the BMW G 310R, which is priced at Rs. 2.99 lakhs, ex-showroom Delhi. However, BMW dealers are offering good discounts on this motorcycle, which is a slow mover thanks to its high price tag. Another great option is the Royal Enfield Interceptor 650, a motorcycle that’s priced just Rs. 8,000 more than the CB 300R. It’s a twin cylinder motorcycle that’s a lot more powerful, and heavier as well. The all-new CB300R is available through 22 Honda Wing dealerships in India. The bike can be booked through any of these flagship Honda two-wheeler dealerships in the Indian market. The all-new CB300R utilises the same frame that is used by the Honda CBR250R. The bike also gets a similar engine, which has been rebored to 286cc. The single-cylinder, liquid-cooled engine of the CB300R produces a maximum of 31 Bhp at 8,000 rpm and a peak torque of 27.5 Nm at 6,500 rpm. The main advantage of the Honda CB300R is its weight. It weighs only 147 kg, which makes it extremely easy to ride on the crowded city roads. The Honda CB300R gets a six-speed manual transmission. Both the wheels of the bike get disc brakes, and the bike comes with dual-channel ABS. It gets the inertial measuring unit (IMU), which is unique in the segment and works by distributing the braking force. The naked CB300R takes inspiration from the Honda Neo Sports Cafe concept. It gets a retro look in the front with brushed metal headlamp unit and flat aluminium handlebars. The bike also gets 41mm upside-down front forks. It gets an upswept exhaust that matches the overall design of the bike quite well. At the rear, it gets the 7-step adjustable mono suspension. Even the front suspension can be set for pre-load and gets 5-steps adjustability. Honda offers a full-LED headlamp set-up with the CB300R. There is a fully digital TFT instrument console that shows all the information and is very easy to read. At the front, the CB300R gets a 296mm, petal-type disc brake with 4-piston set-up while the rear receives a 220mm disc brake with 2-piston set-up. 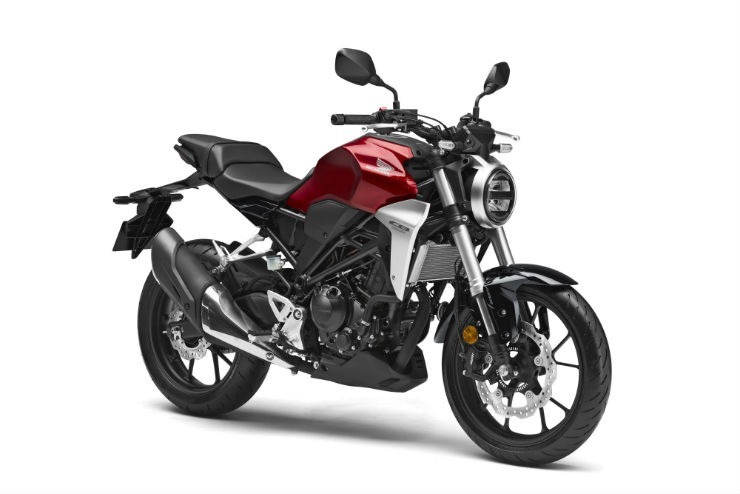 The all-new CB300R gets 10-litre fuel tank, and Honda claims that it gets a range of over 300 km, which will make it perfect for the weekend highway cruisers. The bike also takes on the BMW G310R, which is priced at Rs. 2.99 lakh, ex-showroom, Delhi. That said, the price of the Honda CB300R is slightly lower than the much more powerful KTM 390 Duke, which gets a price tag of Rs. 2.43 lakhs. However, Honda is known for delivering exemplary smoothness and is known for its trusted engines. « Tata Harrier waiting period stands at 3 months: What are your alternatives?